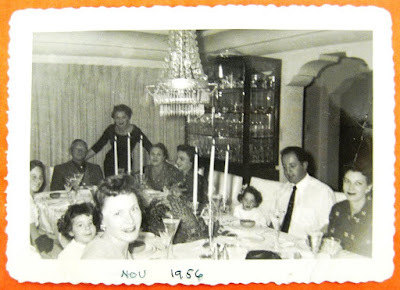 Every year since I was a tiny girl, my Aunt Mae and Uncle Marvin have hosted our family Thanksgiving. Aunt Mae is my Mother's older sister. 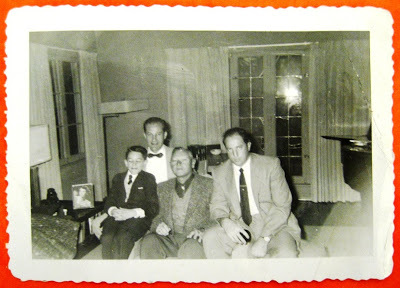 Here we are in 1956 at Mae's and Marvin's duplex on Spalding Drive in Beverly Hills. Those old duplexes had huge dining rooms! Our family has grown substantially over the years. For about 15 years, our group of about 25 has convened at the Del Rey Yacht Club. This year, we're back at home! We will be at Cousin Carolyn's and John's home in Valencia. It might be crowded, but I'm really looking forward to a home-cooked Thanksgiving. Of course, we will have our deli-style appetizers before the traditional meal. There will be chopped liver, herring, dip and chips and more. We may even have LEFTOVERS this year! Woo Hoo! I'm grateful that we'll be together again this year.